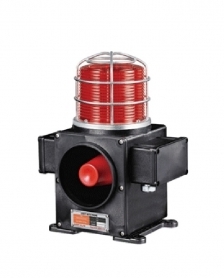 Qlight SCDFL-WS-12-P, 12VDC (NPN) Heavy Duty LED Warning Light with continuous or flashing light and signal horn with five alarms (118dB at 1m). Supply voltage: 12V / 2.633A. Flashes: 60-80 p/min (switch to flash or continuous operation).